Madeira pioneered modern and health tourism as early as the late 18th century. Madeira’s fame came from its mild climate making it a perfect health destination and winter hide-away for the more fortunate ones. Furthermore, the perfect climate and the excellent air quality turned Madeira island into a famous treatment and convalescence retreat. Many conditions ranging from anemia, pneumonia and gout to tuberculosis to name but a few, were treated on Madeira. Consequently, many royal and noble guests stayed on Madeira for health reasons such as Queen Adelaide in 1847-48, Prince Maximilian the Duke of Leuchtenberg in 1849, Empress Amelia of Brazil in 1852 and Elizabeth Empress of Austria (aka Sissi) in 1860. Madeira’s therapeutic qualities spread quickly throughout Europe and doctors recommended a prolonged stay on the island for convalescence. Nowadays many spas provide a wide range of services. In contrast, royals hardly come to Madeira for health reasons anymore. However, many guests appreciate and seek the many therapeutic and spas treatments on offer on the island. Madeira’s nature also contributes to well being. Already very popular in Japan (shinrin-yoku) where it is a recognized therapy, Madeira’s Laurissilva forest provides the perfect forest bathing grounds. Hence, the key to benefit from forest bathing is to live your forest walk fully and with your five senses. Take up nature. Take nature in. Breathe it. Smell it. Feel it. Hear it. Listen to it. Touch it. Observe it. Hug it. Lean against a tree and let its calm strength bring peace in you. Hence, if this is your first forest bathing experience, you can find a guide here to help you get the most out of this healthy activity. Porto Santo also offers therapeutic specialties, namely Psammo therapy. 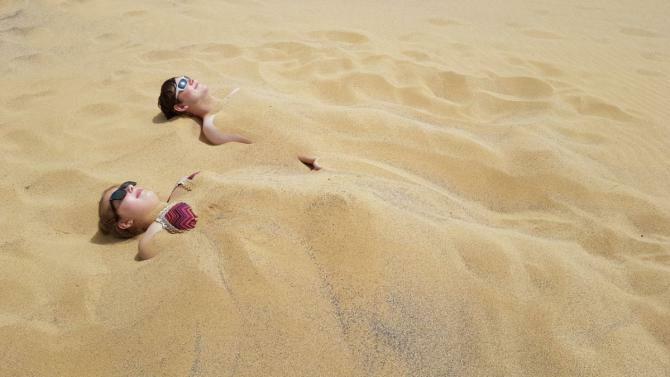 Psammo therapy is a practice of sand bathing for therapeutic purposes. Various universities (*) researched and found that the biogenic carbonate sand from Porto Santo alleviates muscular-skeletal conditions. These are mostly rheumatoid arthritis, gout, osteoporosis and fibromyalgia syndrom. This, according to scientists, is due to the physical (gran size and shape) and chemical properties of the sand. The sand of Porto Santo adheres particularly well to the body. 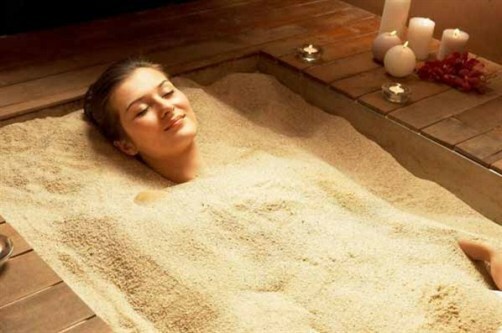 Furthermore, the hot sand promotes body sweating which is essential for the beneficial body / sand interaction. The acidic body sweat partially dissolves the goodies contained in the rich sand. The liquid on the skin surface is naturally enriched in all elements contained in the sand. Hence, the body absorbs the bio-essential elements and natural anti-inflammatory properties liberated by the sand easily. Finally, ten treatments of 30 minutes are necessary to notice improvements. As a result, Porto Santo is well worth a healing visit. Also, you can read more about this little island here.